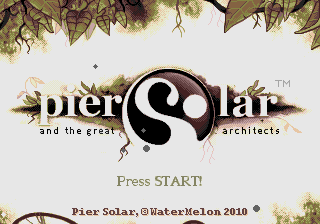 Pier Solar and the Great Architects (ピエアソーラーと偉大なる建築家) is an independently developed Sega Mega Drive game, released worldwide in December 2010 by Watermelon, a group of developers from the Mega Drive homebrew and research scene. It is a turn-based RPG, and, at 8 megabytes (64 megabits) in size means it is currently the second largest Sega Mega Drive game available. It is the first internationally commercially released Mega Drive game since 2002's Mega Games 10 (not counting Super Fighter Team's releases, which have all been translations of games released in the 1990s). The game ships for $35 USD and has a clamshell case with a choice of three cover arts which resemble those used by Sega in Japan, North America and Europe towards the end of the Mega Drive's lifespan. Also included is a 24-page full colour instruction manual and a "MEGA Soundtrack Booster CD", containing the game's soundtrack, which, if the player has a Sega Mega-CD attached, can be used as an alternate source of the game's music during gameplay (however it is not a standalone Mega-CD game). 500 "Posterity Packs" were also sold, with buyers receiving their names in the game's credits and instruction booklet. Reprints only have English, French, and German. In late 2012 a Kickstarter project by WaterMelon was launched with the goal of funding an HD version of the game. 3,519 backers pledged $231,370 USD to the project (whose target was $139,000 USD), leading to development of a Sega Dreamcast version of the game. It was released for Windows, Linux and OS X through the Steam platform, Sony PlayStation 3 and Sony PlayStation 4, in 30 September 2014. A version for the Ouya console was released in October 2014; while Nintendo Wii U and Xbox One versions were delayed to November 2014 due to pending certifications. The game also received a DVD version for Windows, Linux and OS X, in November 2015. Main article: Pier Solar and the Great Architects/Magazine articles.